It was a good weekend for Peterborough Northern Star teams in the Peterborough Youth League. In Under 15 Division One, Northern Star Blue went top after an 8-1 win over Stanground Sports. Ahmad Babakarkhil led the way on the scoresheet with a hat-trick and James Pam and Frederico Rocha both fired doubles. Northern Star also head the Under 18 Division One standings. 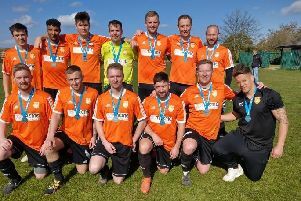 Their latest victims were also Stanground Sports and the game finished 5-1 with James Hill-Seekings (3), Ian King and Peter Southee on target for Star and Ryan Foster-Smith notching for Stanground. There was a big shock in Under 15 Division Three on Sunday as leaders Thorpe Wood Rangers Red came a huge cropper at Riverside Rovers. They lost 8-2 with Callum Boyes and Bobby Moore doing the damage. They both netted four goals. It was a good day for Peterborough Youth League teams in the Under 16 Lincolnshire Cup with Deeping Rangers Blue and Pinchbeck both progressing to the semi-finals. Deeping beat Bourne 3-1 while Pinchbeck beat Caythorpe and Fulbeck 4-1.